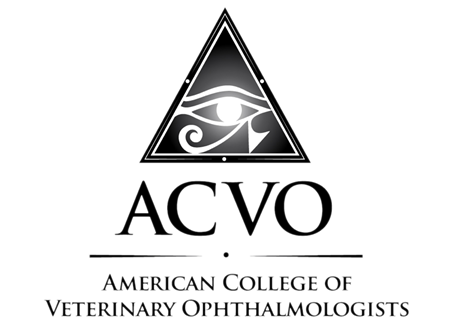 The doctors here at Ophthalmology For Animals have written the articles below as a resource for you concerning your pet's ocular health. Fiction: My dog is too old for surgery. Fact: Age is only one factor when evaluating an animal for anesthesia. When making a decision for surgery, one has to weigh risks and benefits of the procedure and anesthesia. CSK is a progressive, non-painful inflammatory disease of the cornea and conjunctiva. It affects primarily German Shepherds and German Shepherd crosses, but it has also been reported in other breeds (Siberian Husky, Scotch Collie, Greyhound, Labrador Retriever, Border Collie). The cornea is the clear outer layer at the front of the eye. A corneal ulcer means the epithelium (surface layer) of the cornea has been disrupted. Entropion is inversion or ‘rolling in’ of the eyelids, leading to contact between eyelid hairs and the cornea. This contact is irritating and uncomfortable, and causes corneal ulceration, scarring, and pain. Feline herpesvirus (FHV-1) is known to be widely dispersed among the feline population and has been isolated at essentially the same rate in both healthy cats and those with active clinical signs. Pigmentary Uveitis (PU) or Pigmentary Cystic Glaucoma (PCG) is a bilateral inherited disease of Golden Retrievers. The pathogenesis of the disease is still not well understood, but there is no underlying systemic illness associated with it. Anterior lens luxation means the lens is displaced forward into the front compartment (anterior chamber) of the eye. It is a result of breakdown of the fibers (called zonules) that hold the lens in place. Pigmentary keratopathy/keratitis in the dog is due to pigment migration onto the cornea and is a frequent cause of blindness in the Pug, Shih Tzu and Pekingese. Glaucoma is one of the leading causes of vision loss in dogs and people. Glaucoma is a painful disease in which the pressure inside the eye increases and causes damage to the structures responsible for vision. Sudden Acquired Retinal Degeneration Syndrome has been recognized among dogs in the United States for several decades.